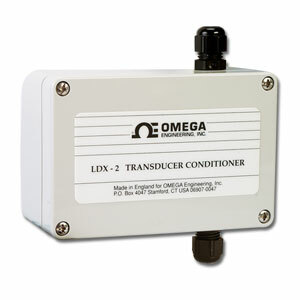 The LDX-2 linear displacement transmitter is a two-wire, 4 to 20 mA conditioner for ac LVDT transducers. It is designed for use where long transmission distances are required before the signal can interface with a controller or meter. A feature of two-wire operation is its low susceptibility to noise and cable resistance, making it ideal for industrial environments. Two-wire operation enables both power and signal to use the same pair of wires.